With 60 per cent deficit in rainfall, Tamil Nadu witnessed its worst drought in 140 years. The farmers demanded a Rs 40,000-crore drought relief package, farm loan waiver and setting up of the Cauvery Management Board by the centre, crop insurance for individual farmers and remunerative prices for their produce. Tamil Nadu farmers have been protesting at Delhi's Jantar Mantar for over 100 days now. New Delhi: Farmers from Tamil Nadu protesting at Jantar Mantar have found an unusual ally. Having no link with the protest, the Delhi Sikh Gurdwara Management Committee (DSGMC) has opened their kitchen to the farmers who have been in Delhi's Jantar Mantar for over three months demanding loan waiver and drought-relief package. 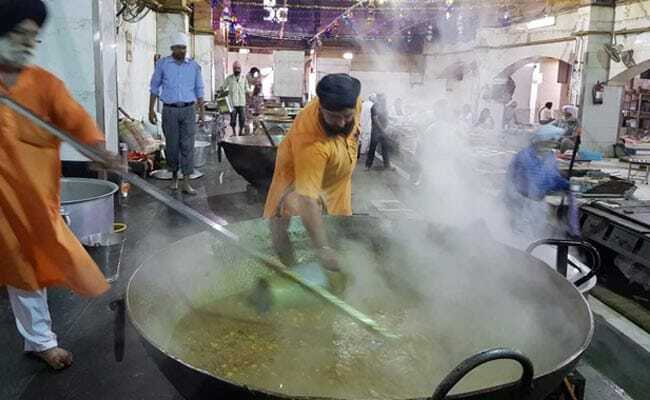 Volunteers at the Bangla Sahib Gurdwara, who work round the clock to provide langar or community kitchen services, have now taken it upon themselves to ensure these protesters don't go hungry. "These protesters at Jantar Mantar come from far places. Neither do they know the language nor where to go to eat. So we deliver langar food twice a day to them. We would have provided them accommodation too, but they haven't asked for that service yet," says Manjit Singh, President of DSGMC. A makeshift tent erected on Jantar Mantar lane has been home to the Tamil farmers for more than 100 days now. With 60 per cent deficit in rainfall, Tamil Nadu witnessed its worst drought in 140 years. The farmers demanded a Rs 40,000-crore drought relief package, farm loan waiver and setting up of the Cauvery Management Board by the centre, crop insurance for individual farmers and remunerative prices for their produce. Usilandian, 45, from Thajavuur district, often known as the rice bowl of Tamil Nadu, is dependent on the langar food brought by the volunteers. Crippled by drought Usilandian's farm is now largely barren. "The bank has confiscated my wife's jewellery, our savings and my family of four eats only once a day. We need to stay here to maintain pressure on the government to act and that is only possible if our stomachs are filled," he said. Bangla Sahib Gurdwara serves langar lunch which has chapatis, dal, sabzi and kheer to around 10,000 visitors everyday at regular intervals. "We initially took the same food for the farmers but soon realised they prefer rice over chapatis. So now we send some rice too. After all, this is Guru ka Langar and we don't discriminate. Some consider it our allegiance to their protest but no, we are just serving those who seek Guru's help," says Manjit Singh. "Our families are hungry back home and we are fighting for our survival here. You volunteers are godsend," R Perumal, one of the leaders of the Tamil Farmers Association, said with his hands folded with gratitude.